Andra Picincu is a certified nutritionist and personal trainer with more than 10 years of experience. She holds a BA in Psychology and a BA in Marketing and International Business. Her mission is to help people live healthier lives by making smarter food choices and staying active. In her daily life, Ms. Picincu provides digital marketing consulting and copywriting services as well as nutrition counseling. She owns ShapeYourEnergy, a popular health and fitness website. In 2014, she launched a local nutrition office and partnered up with local gyms to help their clients take the steps needed to better health. Current and former clients include The HOTH, Nutracelle, CLICK - The Coffee Lover's Protein Drink, InstaCuppa, GritWell, GoHarvey, and more. Mr. Picincu is a regular contributor to these platforms where she either provides health-related content or coaching to those who are interested in achieving a balanced lifestyle. Touted as the next superfood, the green gram is one of the best plant-based protein sources in the world. It's used in both sweet and savory dishes, providing large amounts of antioxidants and phytochemicals. You've probably already tried it, though you may know it under a different name, such as mung bean, green moong, maash or pachai payaru. This small, green legume can improve your digestion, reduce cholesterol levels and boost immune function. But what exactly makes it so healthy? The green gram is less likely to cause bloating and gas compared to other legumes. If you have digestive problems, use it as a substitute for chickpeas, split peas and soybeans. The mung bean or green gram is a type of pulse that belongs to the Fabaceae family. It looks like a small, green seed and can be cooked in the same way as lentils. It's widely consumed in Southern Europe and in Asian countries, and can be purchased whole or as split seeds. Many specialty stores sell mung bean bran and processed foods, such as noodles, pasta and flour made from mung beans. According to the journal Critical Reviews in Food Science and Nutrition, this legume packs a lot of iron and protein. It's an excellent source of dietary fiber, carotenoids, polyphenols and other bioactive compounds that promote optimal health. Unlike other beans, it's easily digestible and doesn't need to be soaked prior to cooking. Depending on your preferences, you can use mung beans as a substitute for lentils or split peas, mix them with veggies, or serve them with curry and rice for an Indian-style meal. These pulses make a healthy addition to salads, meat and pasta dishes, stews, soups and casseroles. Go ahead and try exotic recipes like mung beans with coconut curry, vegan mung bean patties, sprouted mung bean sauté or moong dal. The humble mung bean is a powerhouse of nutrition. According to a 2018 review published in Food Science and Human Wellness, it contains potent bioactive compounds with antioxidant, anti-inflammatory and antimicrobial properties. The nutrients in green gram may help prevent neurodegenerative diseases, improve blood lipids and lower blood pressure. Their anti-diabetic and anti-cancer effects are well-documented. This superfood packs a lot of protein per serving, which makes it ideal for vegans. Plus, it's low in fat and calories. A recent study, which was published in Biochemical and Biophysical Research Communications in 2018, found that mung bean protein can offset the weight gain associated with a high-fat diet. Furthermore, it causes positive changes in the gut flora and protects against hepatic steatosis (fatty liver disease). Green moong packs high amounts of polyphenols, flavonoids, amino acids and other beneficial compounds. These nutrients improve lipid metabolism, fight inflammation and kill disease-causing germs. 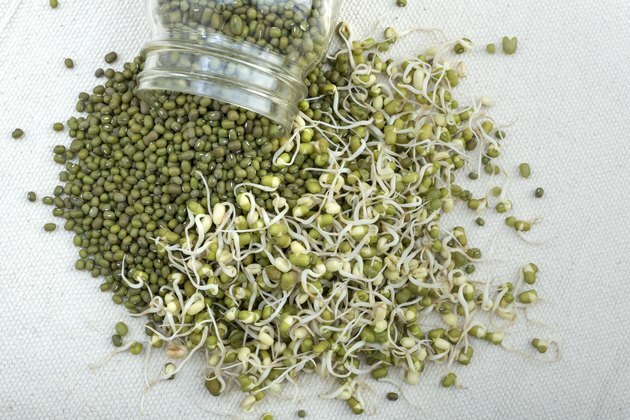 Additionally, mung beans are about 20 percent to 24 percent protein and boast more than 15 grams of fiber per cup. A diet rich in fiber and protein can make it easier to lose weight and cut back on calories, advises a 2018 study featured in the journal Nutrition. As the American Journal of Plant Sciences notes, green moong is easier to digest than lentils, chickpeas and other legumes. It's also less likely to cause bloating and gas and contains less phytic acid than soybeans and grains. Phytic acid is an anti-nutrient that affects your body's ability to absorb iron and other minerals. Pachai payaru health benefits don't end here. The phytonutrients in this superfood have the ability to kill bacteria and other pathogens. According to a 2014 study featured in the Journal of Food Science and Technology, mung bean powder may protect against meat bacteria and reduce spoilage. These legumes are packed with thiamin, riboflavin, folate and other B vitamins that are particularly good for women. Folate, for example, may reduce the risk of neural tube defects, autism, stroke and heart disease. Thiamin plays a vital role in growth and development. This water-soluble vitamin also protects against metabolic problems that may affect the placenta and fetus during pregnancy. Riboflavin, one of the abundant B vitamins in mung beans, is essential for moms-to-be. According to the National Institutes of Health, preeclampsia (high blood pressure) and birth defects are more common in women with riboflavin deficiency. Green gram is also a good source of calcium. This mineral supports blood clotting, muscle contraction and bone growth. It also keeps your bones strong, which in turn, may help prevent osteoporosis, a disease that affects one in three women over 50 years old. Rich in fiber and antioxidants, mung beans protect your heart and reduce bad (LDL) cholesterol levels. A 2015 study published in Evidence-Based Complementary and Alternative Medicine confirms their hypolipidemic effects. Hypercholesterolemic mice fed with fermented mung beans experienced a greater reduction in triglycerides, total cholesterol and LDL cholesterol levels than those treated with medications. Another study, which appeared in the journal Nutrients in 2018, found that cooked and germinated mung beans exhibit hepatoprotective effects. These legumes may help prevent liver damage and reduce fat accumulation in the liver while increasing cholesterol excretion. Germinated beans appear to be particularly beneficial. Elevated cholesterol levels are a major risk factor for heart disease. Eating mung beans is a simple, convenient way to keep your heart healthy. When consumed as part of a balanced diet, these legumes may help prevent obesity, high cholesterol, hypertension, inflammation and oxidative stress, all of which play a role in the development of cardiovascular problems. Plus, they're versatile and can be cooked in a multitude of ways, so you can always experiment with new recipes. What Is the Healthiest Bean to Eat?